Walker Memorial Library, 800 Main St., will host its annual holiday open house from 2-6 p.m. Tuesday, Dec. 11. Immediately before the open house, the library will hold a dedication ceremony for the Eleanor Conant Saunders Reading Room. The open house includes food, beverages, a silent auction and music provided by the Chopin Club and Kathy Blake. Santa will attend from 3-5 p.m. and every child will have opportunity to pick a book to keep. Local author Kathy Eliscu, who had a story featured in the “Chicken Noodle Soup for the Soul: A Wonder of Christmas,” will be available to sign her book. The Rotary Club of Westbrook-Gorham is selling Christmas trees at the corner of William Clarke Drive and Mechanic Street. Trees are available from 4-6 p.m. Mondays through Fridays and from 9 a.m.-6 p.m. Saturdays and Sundays. Tree prices start at $35, according to the club. The public can view decorated trees and a model train display through Saturday, Dec. 8, at the annual Festival of Trees, Westbrook-Warren Congregational Church, 810 Main St., Westbrook. There is no charge to attend the festival. Tree viewing times are 2-4 p.m. and 6-7:30 p.m. on Thursday, Dec. 6; 10-11 a.m., 2-4 p.m. and 6-8 p.m., Friday, Dec. 7; and 10 a.m.-noon Saturday, Dec.8. The model train display can be viewed from 10 a.m.-1 p.m. and 2-3:30 p.m. on Thursday; 10 a.m. to 1 p.m. and 6-8 p.m. on Friday; and 10 a.m. to noon on Saturday. 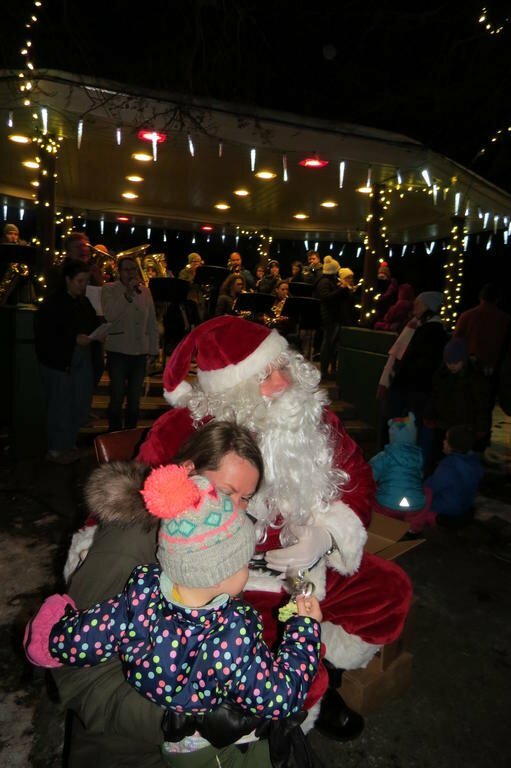 The American Red Cross will hold a blood drive from 1-6 p.m. on Friday, Dec. 14, at Saint Hyacinth’s Church, 295 Brown St.
Santa visits with children as the Westbrook High School Band plays during Westbrook’s annual Tree Lighting festivities at Riverbank Park Saturday, Dec. 1.